Oxon Hill, Maryland (CNN) - The Republican National Committee tossed out controversy-plagued chairman Michael Steele Friday and tapped Wisconsin GOP Chairman Reince Priebus to lead the debt-ridden party organization into the 2012 presidential election cycle. Priebus remains largely unknown to Washington's political class but is now tasked with rebuilding the committee's damaged relationship with deep-pocketed GOP donors and raising hundreds of millions of dollars to compete with President Obama's re-election campaign. The RNC also faces a more immediate challenge: retiring more than $21 million in debt leftover from the 2010 election cycle. The soft-spoken Milwaukee attorney oversaw a banner election year for Republicans in Wisconsin and is a close friend and political adviser to Rep. Paul Ryan and Sen. Ron Johnson, but he is perhaps better known within the Beltway for his ties to the embattled Steele. 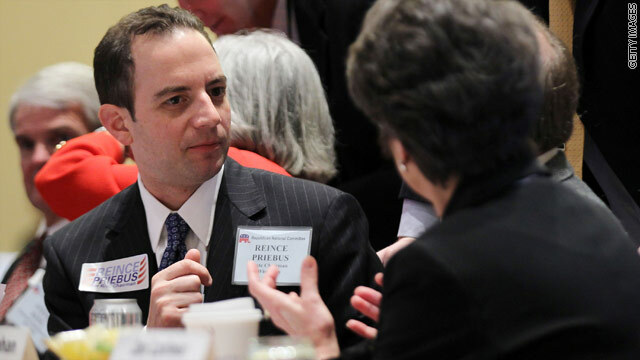 Priebus managed Steele's successful campaign in 2009 and went on to serve as RNC General Counsel, but he resigned the post in December to launch his own bid for the chairmanship after some arm-twisting by Steele critics eager to find a competent committee insider to replace their gaffe-prone leader. "I am here to earn the trust and support of each and every one of you," Priebus said, addressing the RNC following his win. "I am going to start working right now as your chairman. We all recognize that there is a steep hill here ahead of us, and the only way we will be able to move forward is if we're all together." Priebus said the RNC's top priority should be to ensure that the GOP's presidential nominee in 2012 "has the organization in place to beat Barack Obama." His path to victory lasted four hours and was hardly the drama-free exercise that his supporters had hoped for at the outset of the RNC's Winter Meeting, held this week at the Gaylord National Hotel just outside Washington. The voting process, in which the winner must collect a majority of 85 votes from the 168-member committee, lasted seven rounds. Priebus led his opponents from the outset but hit a ceiling of roughly 50 votes after four series of votes at the Gaylord Hotel complex just outside. That left the rest of the field - former Bush administration official Maria Cino, former Missouri GOP Chairwoman Ann Wagner and Michigan National Committeeman Saul Anuzis - rushing into private rooms to discuss possible deals with rivals. Their backers on the committee, meanwhile, worked the room whipping up votes, but no candidate managed to build up a bloc of support to match Priebus. Cino, whose bid was supported by House Speaker John Boehner, picked up a boost from the anybody-but-Priebus camp before the fifth round when Steele dropped out and urged his delegates to back her. Steele earned a standing ovation after delivering a valedictory from the stage. "I really thank you for the chairmanship of this party, for the two years that I have had and at this time I will step aside for others to lead," he said. "But in so doing I hope you all appreciate the legacy I leave, despite the noise. Despite the difficulties, we won." Immediately after the endorsement, rumors shot throughout the hotel ballroom that Steele, who had little relationship with Cino prior to Friday's vote, had cut a deal with Boehner in exchange for his support. Boehner spokesman Michael Steel admitted that his team had spoken with Steele about endorsing Cino, but told CNN there was no "quid pro quo deal." "Boehner has been pretty public about his endorsement, so I think it's fair to say it came up when our folks spoke with [Steele]," the House Speaker's spokesman said in an e-mail. I am sorry to see this, because the cluck was a great bonus for Democrats. I'm afraid the Republican'ts might now be able to get their "stuff" together and be a real menace to democracy. Every good racist has a "black friend". What is the Republican party going to do to cover their true feelings now that they have lost their "black friend"? LOL, the guy was a joke and was used as a tool to get the necessary vote. Now that the votes are in, c ya. I am really going to have to work to be a good democrat, when I read the article, sadly the first thing that occured to me was political not racial, I guess I just can't think in race-bias, like liberals. Tony FL 'One black man is enough'? I resent that! They have two now! Look at all the "civility" in these wonderful comments by our Liberal Left. Sounds like some pretty "Heated Rhetoric' to me. Way to go Guy's...what it take...a week to get back to buisness as usual??? Really? How about you work on the economy? Focus on the American people and our needs instead of assuming the position of attack towards President Barack Obama. It is just not possible for the Republicans to work with anyone so that the job can get done. Its their way or no way at all. Finally! There has never been a leader less effective than Steele in the history of American national parties! His own party hated him! The only thing he is remembered for is apologizing... to Rush Limbaugh for going against pundit rhetoric! So... an even more no-name replacing a no-name. Republicans really want to keep elections interesting, don't they. WOW. Such a diverse crowd. Let me give you insight into the future of this next Congressional term. Two RNC members did not even have enough respect to attend the swearing in ceremony. Why? Too busy partying and asking for contributions. Why? Because their Party is Bankrupt. Much like the idea anything will be different or anything will get accomplished. Doesn't matter who is at the helm. Statistically speaking, the GOP is no more Caucasian now than yesterday. It is still 99% Caucasian. The poor schmuck doomed himself way back when he first called Limbaugh an "entertainer," and then had to come crawling back with a humble apology the next day. Let the Repuglicans keep swinging farther and farther right. Hopefully they will soon leave the country far behind them, in the sensible middle. That is no surprise at all. PLEASE, bring back Steele! He was at least entertaining giving republicans a laughable image! Oh goody! Looks liked 2012 just got a lot easier. Everybody's going to identify with the stiff looking rich guy with the $20M name. I can just see the truckers getting all antsy to go run out and vote now! Looks like a real blue collar type. The only thing I remember Steele for is apologizing... to Rush Limbaugh for not parroting his extremist far-right propaganda. Well, well, well! Why is anyone acting surprised by the RNCs ousting of Michael Steele? They kicked him out of power like his name was really Noriega. Bobby Jindal would have been a better choice. A rich middle aged balding white guy. Sounds about like the standard repubbie. Guess the republicons finally figured out they were not fooling anyone by keeping the "colored fellah...." around.